Kenosha Community Media turns 30! Kenosha Community Media is celebrating its anniversary! The non-profit public access center is marking 30 years serving Kenosha County residents and non-profit organizations. John Bloner, the City of Kenosha’s Technology & Media Specialist, is excited about the future of community television in Kenosha, noting that KCM is always busy, six days a week, providing access to the studio, field camcorders, and editing equipment to those who have taken KCM’s video production training. Besides helping non-profits, KCM staff also covers community events like the 4th of July Parade, symphony concerts, community-wide spelling bees, and most recently, the construction of the Kenosha Dream playground, a fully-accessible play area for children of all abilities. KCM will be thanking its volunteers with a reception and then throwing a party with music, dancing, casino games, raffle prizes and more. 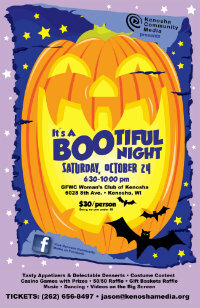 “It's a Boo-tiful Night" will be held at the Woman's Club of Kenosha on Saturday, October 24th from 6:30-10:00 pm.